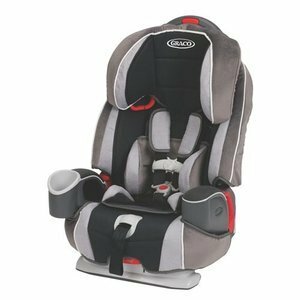 This advanced 3-in-1 car seat, featuring the Simply Safe Adjust™ Harness System, now keeps your child harnessed up to 70 lbs and converts to a booster seat up to 120 lbs for years of use. Higher weight limits for children 20-70 lbs forward-facing in a harness, 30-100 lbs in the belt-positioning booster and 40-120 lbs in the no back belt-positioning booster Simply Safe Adjust™ Harness System is safe & simple with a one-hand, no re-thread harness that automatically adjusts Side-impact tested* (*In addition to meeting or exceeding all applicable US safety standards, the Argos 70 car seat has been side impact tested for occupant retention solely with the built-in 5 point harness system) Engineered & crash tested to meet or exceed US standard FMVSS 213 Steel-reinforced frame provides strength and durability 3-position recline helps keep your growing child comfy One-hand, adjustable headrest easily adapts to your growing toddler’s needs EPS, energy absorbing foam for effective impact energy management Integrated child's cupholder keeps drinks close by Contoured armrests with cup holder and storage pockets Open-loop belt guides help you correctly position your vehicle’s seat belt LATCH-equipped 29" x 20" x 22"
Smartest car seat out there! I've bought 2. Love that it grows from infant to toddler so there's no need to waste time and money buying two types. It's reclines, and it's easy to adjust as they grow. Easy to clean in the washer. Has cup holder. Can be installed with a seatbelt or built in straps. overall i highly recommend this convertible carseat! i It was pretty easy to assemble, easy to install, easy to adjust straps with one hand, built has a built in cup holder, and is nice over all. I we love that it grows with our child through baby, toddler, and preschool years and beyond. It converts to a backless booster seat as well. So this all in one saves money in the long run! It is fairly easy to wipe clean, it has some really nice unisex colors, and the tight buckle mechanism is great because you have to push hard to buckle it.. 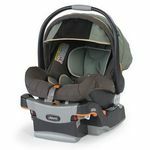 I say this because it keeps a smart baby or child from being able to unbuckle him/herself. I know some think that is a negative and inconvenient, but I like it. And the price is not in the ridiculous range either. It seems to be very durable, and will hold up well. I have a son that is now 9 years old. I have used this car seat repeatedly after being in two car accidents that were not my fault, and one which left me with a herniated disk in my lower back. Both time my son was with me in the car. The first time he was about 3 years old, and the car insurance company replaced the car seat after being in an accident. The second time he was about 5 years old. Again, when having the option to buy a new one for free I chose this one yet again. It kept my son safe from harm, he did not feel a thing, and that is the most important thing to me. I think the installation wasn't so hard to do with my car for the car seat. I did not have any issues. The fabric is nice and doesn't get hot with heat or too cold when it is winter outside. It comes off easily and washes well in the washer. Sometimes, when my son got a few minor spills on the seat I could just take a wet sponge with some dawn on it and it came right out without having to take the seat out or the fabric to wash in the washer. I also like the fact that my boy is taller for his age and this car seat holds up to 70 lbs. His last before that we had with the harness (it was also a graco) held only 50 lbs with the harness. This meant I could keep one car seat until he was ready to go into a regular seat and buckle in the car for him. 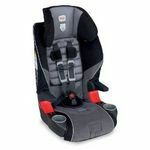 The only thing I did not like about this car seat is that when he fell asleep, especially when he was younger, the head rest did not support his head so well, and most of the time he would have his head hanging low like an old grandfather stile instead of relaxed and comfortable to the side on the seat. Over all my first impression of this seat was and still is awesome, especially for the safety features and how it has protected my child in a car accident. Ease of Installation I did not have any troubles with the installation of this car seat. I have the latch hooks, one at the top of the car and two on the sides on the seat. And it fit just fine. I have a four door sedan perhaps it wouldn't fit so well in a smaller car though. I did find it was a bit hard to recline the seat as instructed but my boy didn't seem to mind. Child's Comfort My boy really loved this seat and said it was very comfortable. The straps were easy to adjust as he grew and never left marks or seemed uncomfortable for him. The only thing I think was an issue is when he fell asleep his head would lull in front of him instead of resting comfortably to the side because of the way it sits upright and there isn't much to the sides by the head. Especially when they are younger and do not reach the top of the seat yet. Support and Safety I was in two no fault accidents with this car seat, the insurance company gave us money to purchase another one after the first one and second one, each time I chose to buy this car seat as it kept my son safe and secure while unfortunately I suffered a back injury on the second accident. My son is older now and does not need a car seat but if he did I would certainly recommend this seat! Ease of Use I thought it was very easy to use and did not have any troubles with getting the belts adjusted properly as my son grew bigger. No problems buckling and unbuckling him either. Design The only design flaws I see are it sits upright too much and although it says you can recline in the car or put it in recline position I was not able to get the seat to do this so when my son fell asleep a lot of times his head would fall forward and wake him up. Also, the top of the head rest is shorter on each side which doesn't allow for them to stay upright when sleeping. Durability This seat is rugged. Takes a beating, and keeps on going. As everyone knows boys are extremely tough on anything and this thing kept on going and was useful when we are done using it for my sister to use it for her grandson, who currently uses it and it still is sturdy and safe. The fit and quality are one of the best I've had. One of the main reasons I give this seat such a high rating is because of how easy it is to get the correct fit on your toddler. We used this seat (still have it) for our foster children. You're suppose to be able to get the belt that goes over the lap to lie flat and over the thighs, but I'd had trouble in the past with the lap belt riding up to the stomach, which is not safe. This Graco Argos 70 laid perfectly; thank HEAVENS because our last foster son was fidgety and had to have things just right or he'd have fits. The other part of the fit that has to be correct is where they shoulder harness lays. It has to be over the middle of the shoulder and not next to the neck or too far over the shoulder. It was so easy to get this car seat to fit the kids we put in it, and I think that's a first. We've gone through several car seats and car boosters, but this one has been my favorite so far. It's like the Cadillac of car seats with extra cushioning around the sides so it supports their heads if they fall asleep. The design is quite snazzy looking with key levers in the color of red so it's easy to find when you need to pull or click. Like the very top part by the head, which is adjustable. The quality is first rate -- obviously-- because it is holding up extremely well and easy to wipe up spills, etc. If you're looking for durability and comfort for your toddler, I would highly suggest this particular cars seat. Car seats aren't just purchased for safety; they're also necessary for comfort because there's nothing worse than an uncomfortable kid while trying to drive. Ease of Use This was my favorite part. Design Classy looking. Blends in well with our vehicle. My wife and I bought this car seat when our two year became to big for his rear facing dual seat. We were immediately impressed at how much room was in this seat and still had the security and safety that made us both comfortable. I am also very happy that it has a cup holder on the seat which makes it very convenient for long car rides. Ease of Installation Although it is not as hard to install as the rear facing dual seat that we used for so long it is still more difficult to install than the booster seat that my five year old uses. Child's Comfort The seat offers plenty of room for my son to stretch out but it is still confining with the seat belt structure. Support and Safety The way that the seat belt is thread through the back of this seat gives me piece of mind that it is not going anywhere and the harness on the seat itself gives me added security that my son will be safe. Ease of Use The harness structure is a little bit difficult to use at time and the seat sits so high I need to lift my son up to get in the seat. Design A very attractive design that looks good in my van. I really like the placement of the cup holder too. Durability We have spent plenty of time moving this seat between cars and a boat and have washed the cover multiple times and the seat is as good as the day we bought it. I bought this car seat when my then 9 month old was too big for his rear facing seat. He is huge for his age. To give you an idea he is 2 and the size of a 5 year old. Very tall and about 40lbs now. Very healthy, doctors say, just very big for his age. Then again, I have a 22yr old that is 6'4 and a 19yr old that is 6'6 so I'm guessing I just breed BIG boys. I needed a car seat that would grow with him so I didn't have to buy another one in a year or so. When I found this one, I was hesitant due to how bulky it was. Talked into it by the salesman, he said I could return it if I wasn't fully satisfied so I walked out the door with it. I was a bit annoying to install the first time but can do with ease now. I have already had to adjust the height and the straps which I was able to do very quickly and easily. I also love that it has a cup holder, my son drinks more water than most adults and always has a cup with him. Glad I got over my hesitation and bought it and will be buying another one this week to go into his fathers car so I don't have to take mine out constantly when he goes to stay with him. Super pleased with this product! Ease of Installation First time was a bit difficult, but now that I've got the hang of it, super easy. Child's Comfort My son is so comfortable he will actually fall asleep in it. 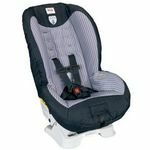 Support and Safety As long as it is installed correctly and the straps are set correctly, your child will be safe! My son's car seat doesn't move a millimeter....ever. Ease of Use Buttons and latches are easy to use. I've seen some other car seats that have difficult to buttons and latches to push. This one is easy! Design Love the design. Simple goes with any car decor. Durability Heavy duty. A bit heavy to carry around but completely durable. I bought this car seat for my daughter a while back when it was time to front face her. I picked it because it was a bit bulky and felt like it had more protection. My daughter loved it and didn't have a problem with the change in car seats. I liked the colors and it was simple enough. It was easy to assemble and to install into the car with the latches. As far as cleaning the car seat, it was easy enough once I figured out how to take apart all the pieces to throw in the wash. Overall, I felt like my daughter liked it and it fit well with my car. We still use it now so it has been durable and worth the money. I would purchase again if I had to do it again. My only con is it'd be nice if there were a few more colors and designs to choose from. I wanted a little something more girly for my daughter, but liked that the car seat was neutral enough for both boy and girl. This car seat came really recommended at Babies r Us and I recommend it as well. Excellent choice for pre-toddler and toddlers. Nice safety features with comfort. Easy to install in your car, easy to disassemble for cleaning, and versital. I like that I was able to convert to a booster seat, and my son especially appreciates the cup holder. Ease of Installation Very simple to install in your vehicle. Just anchor it in and then thread your seat belt through the channel provided in the back. 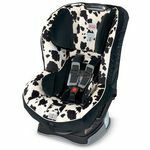 Child's Comfort STRAPS SECURE CHILD IN WITHOUT CINCHING TOO TIGHT, BUCKET SEAT DESIGN IS NICE TO CRADLE THE CHILD. Support and Safety Good support without sacrificing comfort or safety. 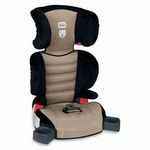 As a car seat it cradles your child when in the recline position, very nice if you have a child who falls asleep a lot on car rides. And the extra STRAPS for anchoring help keep the seat from moving about. Ease of Use Very easy to use and install. STRAPS are easy to use and do not twist or tangle easily. Design Very nice design keeps CHILD snug in the seat, very comfy as a booster. Durability Very durable, can take being bumped or dropped with very minimal damage. Any damage would be cosmetic and not to the function of the seat.